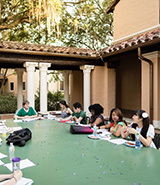 The Rollins College English Department empowers students to pursue meaningful lives and productive careers through the study of literature, writing, television, and film. Our purpose is to develop engaged, informed, and responsible citizens of the world by exposing students to a multiplicity of texts and authors, extending and enriching their understanding of the world, of others, and of themselves. We inspire our students to think deeply and engage critically; to understand the complexities of the writing process; and to question how their ideas and words can make significant contributions in an increasingly cosmopolitan world. In every course we teach, whether it be in American or world literature, creative or professional writing, television or film, we foster creative, flexible thinking guided by the belief that reading, writing, viewing, editing, and composing are critical skills for success in the 21st century. Our English majors read broadly and deeply, graduating with the ability to apply their love of literature, media, and writing to any field. While students read a breadth of diverse literature, they can design much of their major, choosing a concentration in either writing or literature, pairing their literary knowledge with fiction, poetry and film writing, creative non-fiction writing or professional writing. The English Department fosters a discussion-based, interactive classroom environment and meaningful interaction between faculty and students in and outside the classroom. We strive to create active global citizens both in the classroom and beyond, offering our students opportunities to study abroad all over the world, to interact with prize-winning writers in our Winter with the Writers program, to join Sigma Tau Delta, our English Department Honor Society, to collaborate with faculty on summer projects ranging from collaborative writing to graphic novel adaptations, and to participate in readings and events throughout the year. English majors learn to integrate sources, build arguments, challenge assumptions, and to write with clarity, coherence, creativity, and precision. Rollins English faculty’s highest commitment is teaching and to our students, and our guiding principles are excellence, innovation, and community. Rollins English faculty model active scholarship and writing, presenting research at national and international conferences, and publishing in innovative and prestigious journals. Our literature and writing faculty have published scholarly and creative books on topics ranging from the Book of Job to Bollywood to Baseball. They have appeared in anthologies from Norton to Garrison Keillor’s The Writer’s Almanac to Prize Stories: The O. Henry Awards and have won numerous awards for their work, including Pushcart Prizes, NEA Fellowships, Editor’s Choice Awards, and The Flannery O’Connor Award for Short Fiction. Rollins English majors are successful in a multitude of professional fields, from law to screen and script writing, from the publishing industry to finance, government, and journalism. The English Department’s highest calling is to ensure students graduate with the skills and perspective to be productive professionals, cosmopolitan individuals, and ethical and responsible citizens of the world.